Creating the oldest private land trust in the Tidewater Potomac region. Preserving important genetic diversity within the agricultural gene pool with the establishment of the National Colonial Farm Museum. With the establishment of Piscataway Park, creating a new kind of national park that includes private property by design, which preserves the public’s interest and private owners’ rights at the same time. Enabling Prince George’s County, Maryland, to become the first jurisdiction in the nation to grant local tax relief for the donation of scenic easements. Setting the precedent with the Internal Revenue Service that allows for the deduction of the value of a donated scenic easement. Beyond her work with the Accokeek Foundation, Mrs. Bolton was one of the most influential women in America during the 20th century. The daughter of a prominent family, she was elected to Mount Vernon’s board in 1938. The following year, when her Congressman husband died, Mrs. Bolton was appointed to serve out his term. Then she ran and was elected in her own right. By 1955 she had established herself as a powerful member of Congress. Frances Bolton was the first woman to be elected to Congress from Ohio. She was the first woman member of the Congress to represent the United States in the U. N. General Assembly. She was the first woman Member of Congress to visit a war theatre. She was the first woman to head a Congressional delegation abroad. She sponsored legislation that gave nurses regular officer status in the military. She also battled racial segregation and championed women’s rights for her entire Congressional career. 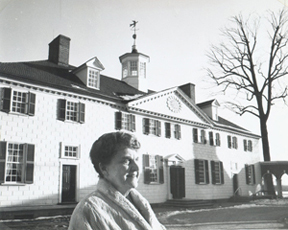 Mrs. Bolton continued to serve as the Accokeek Foundation’s President until her death in 1977. A bronze plaque in Piscataway Park commemorates her service to the nation. The Accokeek Foundation established the Frances Bolton Society to continue Mrs. Bolton’s legacy through planned giving. This entry was posted in Featured Blog, Stewardship and Conservation and tagged land trust, mount vernon, National Colonial Farm, Piscataway Park, planned giving, viewshed, Women's History Month. Bookmark the permalink.